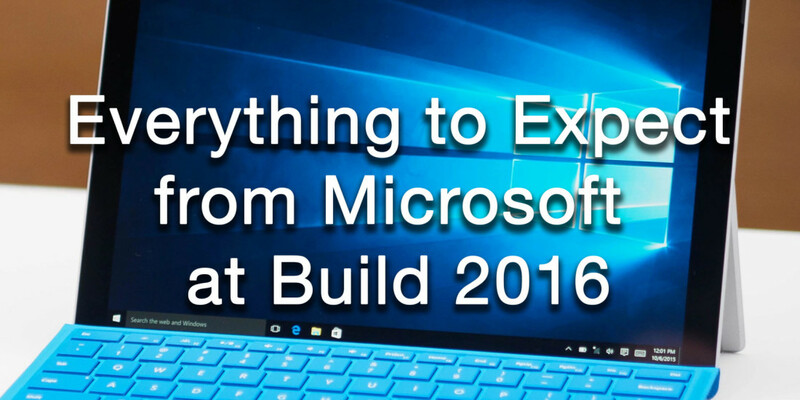 It’s that time of year: Microsoft’s Build 2016 conference is upon us. Running for three days starting March 30, Microsoft biggest developer event will surely be saturated with software news, and maybe even some hardware too. This year, the company is being extremely tight-lipped about what’s to come, but hints and rumors (including some very excited tweets from Microsoft employees) suggest we have much to look forward to. Here’s a look at some things that are likely to come, and things we might still have to wait on. Now that Microsoft has adopted a ‘Windows as a service’ model, you can expect major updates to come much more frequently – akin to Apple’s OS X release cycle. The next big update, codenamed ‘Redstone,’ is set to be revealed at Build. Extensions for the Edge browser: Microsoft finally made extensions available for Insider members this months, so these will play a large role in improving the browser for Redstone. The company is even working on a tool to port extensions from Chrome. The native app suite in general seems to be getting a refresh. Microsoft may be bringing Google Photos-like functionality to its Photos app for Windows 10. The app would allow people to find photos based on the people and locations in them, with automatic tagging. It will also include more editing features. Cortana will get smarter, including the ability to notify you when your phone battery is low or read push notifications. Microsoft will be bringing a Google-like card UI to the Windows 10 Action Center and Cortana, making them more interactive, according to WinBeta. Microsoft could also considering adding filters to Action Center to reduce the notification noise. And that’s about all the big news we know. Again, not too exciting, but it seems we haven’t seen anything yet. A Microsoft program manager teased that we are all “going to FREAK OUT” on Twitter, while another suggested the features “are going to CHANGE EVERYTHING” (emphasis theirs). That’s a lot of hype for a Windows update. Microsoft confirmed this one just a couple of weeks ago: the Xbox One will soon be able to run Windows 10 apps. These are Univesal Windows Platform (UWP) apps that can easily be made to run on any device from a phone to a desktop – and Microsoft’s now opening the door to the Xbox as well. It’s a particularly big deal for small indie games; it means developers can easily build cross-platform games that can run on both your smartphone and your Xbox. That doesn’t mean you should expect full-fledged flagship games, but it bodes well for extending the Xbox’s longevity, plus bolstering Windows Phone’s game offerings. Speaking of the apps, Microsoft knows that it needs to push the development of the UWP for Windows 10 to move into a modern era of app making, including light, touch friendly software. But it’s also important for another reason: revitalizing Windows 10 Mobile. By making the UWP the main way of building Windows apps, Microsoft is making it easy for developers to bolster its mobile offerings. Following the theme of cross-platform development, Microsoft bought Xamarin – a company that makes it easy to build apps for both Android and iOS – last month. While Microsoft has said little about what its next steps are, it told us to expect more news during Build. While the purchase is likely an effort to help port more Android and iOS apps to Windows Mobile (or even the desktop considering the UWP), it’s also worth noting that Microsoft has been heavily invested in creating more apps for team Google and Apple as well. After all, Satya Nadella is all about the cloud. Instead of joining the fray of virtual reality contenders, Microsoft chose to tread its own path with augmented reality (or ‘mixed’ reality, as the company prefers to call it). Given that the HoloLens developer kit is due to start shipping on March 30, you can expect the company to make some mention of it. Who knows, we might even start to see what the final consumer version will look like; it would be good timing. Rumors have been flying around about a Surface Phone for ages now, so this would certainly be the big news of the day. After the lukewarm response to the Lumia 950 and 950 XL – which felt more like powerful dev kits than flagship consumer devices – Microsoft really needs a well designed phone that can stand out in the public eye. The timing would certainly make sense, but there have been virtually no rumors to indicate that such a device will be shown off during build. But just a mention that it’s coming might be all Microsoft needs to build up hype, especially among the Windows Mobile fans. The Surface Pro might be the more popular of Microsoft’s Windows tablets, but the smaller Surface still deserves some love. It’s been almost exactly a year since the Surface 3 was announced, and it could use a spec bump to match up against more and more solid Windows 10 tablets. With Sony diving head-first into VR, and rumors that Nintendo’s NX could even support the technology, you might think Microsoft has been secretly working on its VR platform all this time. However, it’s unlikely we’ll see an Xbox VR headset anytime soon. Don’t expect Xbox and HoloLens compatibility just yet. Xbox lead Phil Spencer has already implied the company isn’t working on a VR headset because it doesn’t yet have “something unique to add” in the multitude of offerings ranging from Playstation VR, to HTC and Steam’s Vive, to the Oculus Rift. Speaking of Oculus, Microsoft also has a partnership with that company – it comes with an Xbox One controller, and you can stream your games to the headset – so it’s unlikely to come out with a VR headset of its own right at this moment. A HoloLens-related feature might be a bit more likely, but it’s hard to say what HoloLens can add to the gaming experience, and it seems more like something for E3 than Build. Simply put, it’s too soon. These devices were announced in October, and it’s too soon for any notable spec bumps. That said, I’d love to see an updated base for the Surface Book. USB-C and even more powerful graphics or a larger battery would be awesome, even if in a thicker base, but Microsoft’s given no indication it plans on upgrading the bases. That’s a shame: upgradability has the potential to be the Suface Book’s best feature.